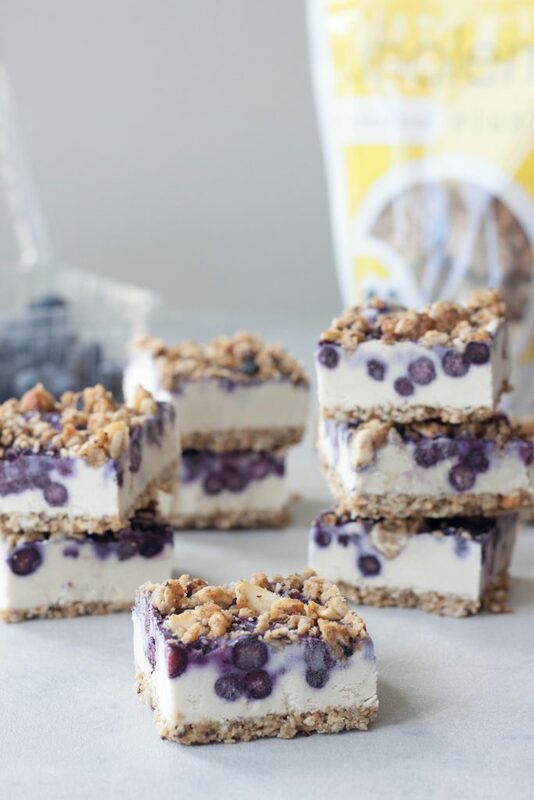 Father’s Day is just around the corner and these No Bake Blueberry Cheesecake Crumble Bars are the perfect no bake treat to make him. When I think about my dad I think about blueberries. I’m not sure why as he eats pretty much anything. It could be that I remember him eating them with the girls when they were little. Or the trip up to Canada where S and him picked wild blueberries. Maybe that when the girls were younger they always had to bring blueberry jam up to grandpa because he loved it and we could get it at Trader Joe’s, or later Crofter’s Organic, and he didn’t have either where he lives. Whatever the reason it just got me thinking it was the perfect time and reason to whip up this cheesecake. It’s so easy that the girls could even whip this up for their dad, although we usually make my husband some crazy cake like a 3D fish one we made one year that looked like a big puffer fish with chocolate fins. I really should find that picture to share because it’s too cute and they were so excited they decorated it all by themselves, except for me helping to heat the chocolate for the fins. I had planned on making this with a pecan crust but a couple days before I was going to make it again to photograph I realized I had a few bags of my favorite Whole Me Lemon Berry Chia Clusters. If you follow me on Instagram you know their a favorite so I stock up, especially when they’re on sale, and have them stashed everywhere. No this isn’t a sponsored posted it’s just a product I love by an amazing local company owned by two talented women. I actually went to a brunch there this past weekend and was going to bring these bars as I photographed them last week but they were gone, well all but a couple I had hiding. So I got to thinking, of course as I was munching on some clusters, that because of the texture they would probably make a great crust. Not only that but I love the lemon blueberry combo, it would be fresh, and it would actually be a whole lot easier to make a crust with a bag of those then a bunch of other ingredients. It would even cost less then buying all the nuts, dates, ect and use up the bags that I had that were going to expire soon. Not that I wasn’t up for a challenge of eating them all before they did or sharing them with friends. As for nutrition, the clusters are made with simple whole food ingredients and might actually be healthier with the chia seeds than just using a nut based crust as planned. They are gluten free, paleo, and dairy free the only thing would be they aren’t vegan as they are made with honey if that’s a concern. So pour a bag into the food processor, pour into the pan, and press and your crust is done in less than 5 minutes. Blend the cheesecake ingredients, pour, top with thawed blueberries, swirl, top with optional clusters (which hey is great if you decide you aren’t crazy about your swirl or want to add a little extra texture and flavor and it reminds me of another favorite dessert… crisp and crumbles) and you have a no bake dessert in less than 15 minutes! Ok you do have to soak the cashews overnight or for at least 4 hours and you do have to wait a couple hours for the cheesecake to set, but hands on time is very minimal and it’s easy. I’m all about healthy, delicious, quick, and easy right now with things being so crazy! 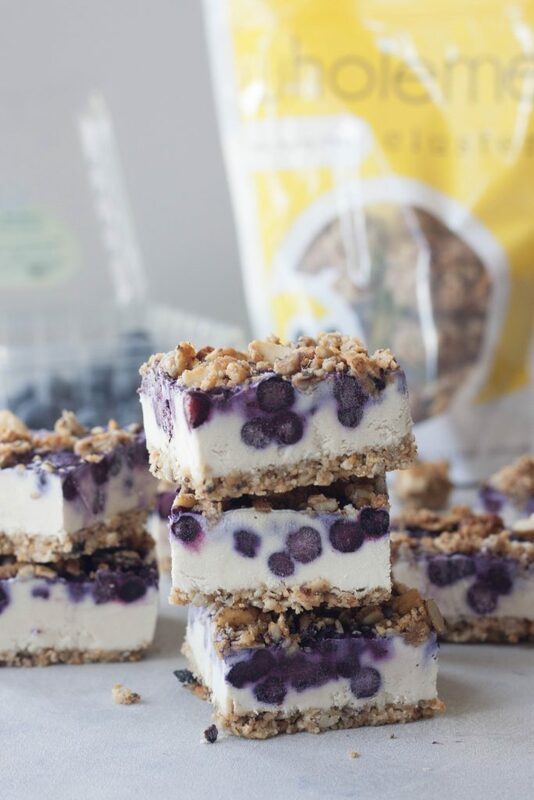 No bake is perfect for summer, or these hot humid days we’re having that came out of no where. I will make one exception and that’s baking our sourdough bread, that’s just because it’s become such a staple. As much as I’d love to bake up a big elaborate cake or dessert we usually end up throwing a lot a way and they don’t agree with S’s or my tummy and that’s no fun. With no bake bars like these we can store them in the freezer and pull them out when we want to enjoy them. In an airtight container we’ve kept them for a couple weeks. 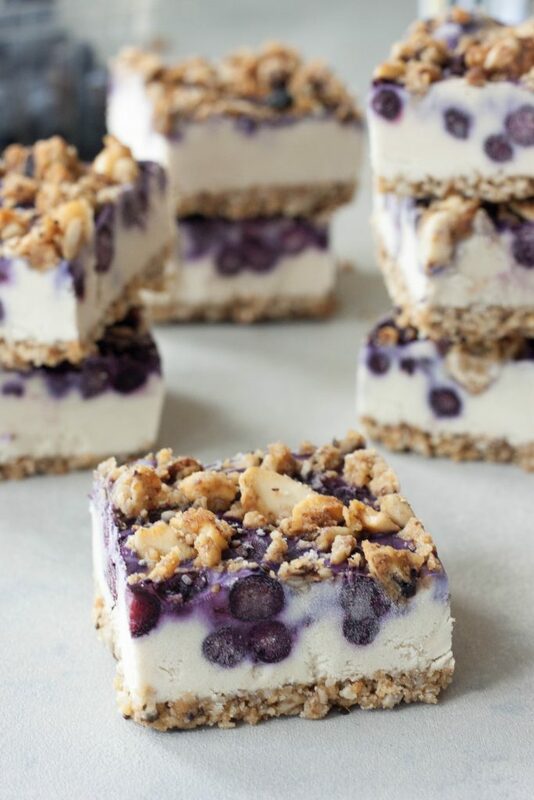 Great for Father’s Day or a summer bbq (although these wouldn’t be ones you’d want to have sitting out for a potluck, how long you leave them out will depend on the temps and they are best chilled or cooler than room temp) you really don’t need a reason to make these bars! *If you don’t want to use, cannot find Whole Me Clusters, or want a vegan crust you can make with the pecan crust from this recipe. Or you can use another granola, if it doesn’t stick together pulse in 1/4 cup of coconut oil. **I like to use thawed frozen wild berries as they are smaller and sweeter. If you would like to use larger berries you can or you can even blend them into the cheesecake, adjusting sweetness to taste if using fresh berries. Prepare a 9×9 pan lining with parchment paper. In a food processor pulse clusters until you have a coarse crumble. Press into the bottom of prepared pan. Place in the freezer, while this isn’t necessary I find it helps me make sure I have a level area in the freezer ahead of time and works for doing it in steps if I’m not doing it all at once. To make cheesecake rinse and drain the soaked cashews. In a food processor, or Vitamix, pulse cashews until they are broken up as much as possible. Shake your coconut milk before measuring and add to the cashews with sweetener, lemon juice, and vanilla. Blend until smooth, scraping down the sides as needed. I find the Vitamix will make it the smoothest. Pour cheesecake over prepared crust. Slightly defrost frozen blueberries so they aren’t stuck together and place spoonfuls on top of the cheesecake and run a knife through to swirl. If topping with additional clusters break clusters into small pieces and sprinkle over top, gently press them in if needed. Place on a level surface in the freezer for 2-3 hours, or until serving. Remove from the freezer 15 minutes before serving. Carefully cut with a sharp knife and serve. Enjoy! No bake is always good! I see most of the recipes use full fat coconut milk is there a difference in consistency if you use the low fat? Yes, especially during the warm summer months! Full fat canned coconut milk is thicker and often the liquid is drained off after chilling and coconut cream is left. THIS LOOKS SO SO SO DELICIOUS!!!!!! OMG I really need to try out this whole cashew subbing for cream cheese cheesecake trend. Yum! Yes so creamy and delicious and great for those who can’t have dairy! These are SO me! I love everything crumble and the dairy-free cheesecake aspect makes them irresistible. I think you’d love them Alisa! What a great way to repurpose the chia clusters! 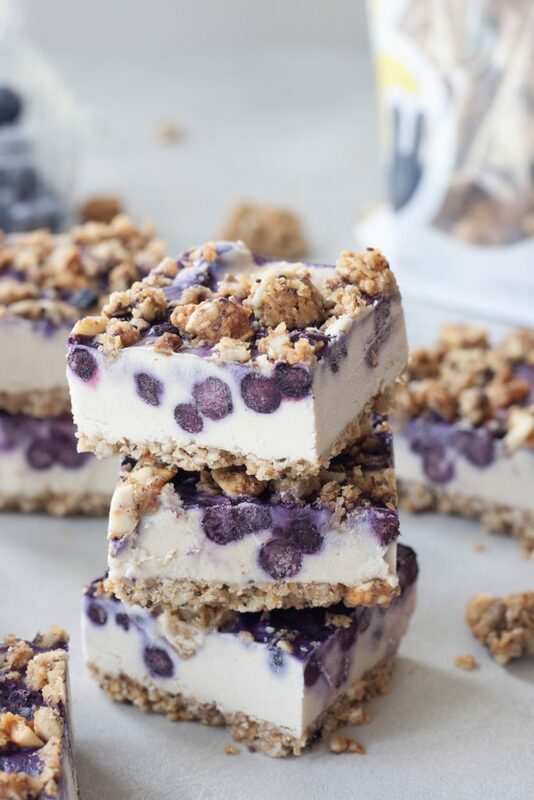 This is such a pretty looking dessert, I bet wild Canadian blue berries would be perfect for this if you can get your hands on them. They were always a favourite when growing up (now an allergy… boo). YES, love wild Canadian blueberries! One summer my oldest picked and ate so many. She would wake up in the morning and walk outside in her pajamas to pick them. Can’t wait to get back up there. 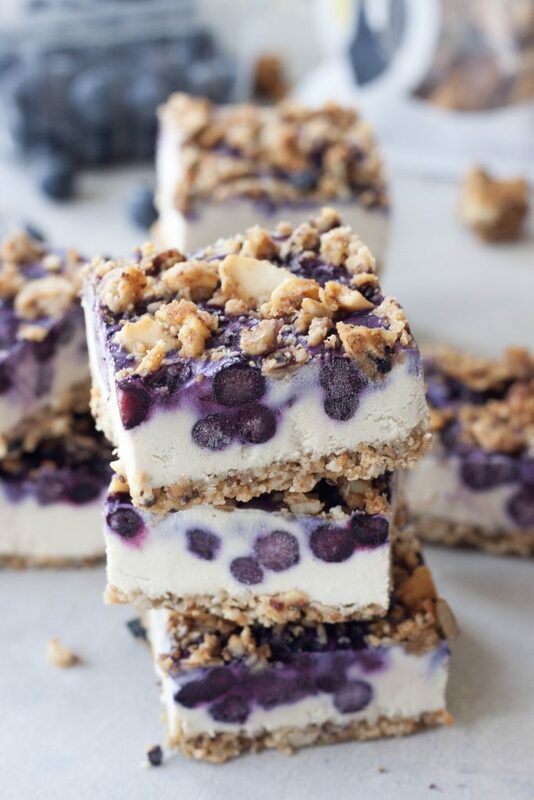 I love no bake cheesecake and the blueberries with the crunchy granola look amazing! Thank you, aren’t no bake desserts the best for summer? Oh man these look amazing! Not only am I sure they taste amazing, but they look so impressive! Thank you, they’re so easy too! These look so good! You are so right! They would be a great dessert for Father’s Day! Loving no bake recipes right now! These bars look HEAVENLY and so perfect for summer! Aren’t no bake recipes the best for summer? Thank you! I could go for one of these right about now! Sounds like such a delicious treat! Thank you Jessica, come on over and I’ll share one! This looks great for father’s day! You take the nicest photos.